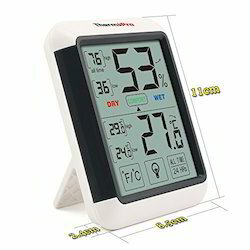 Wholesale Trader of a wide range of products which include digital hygrometer 288-cth, thermometer dt-302-1/ dt-302-2, thermo hygrometer, j412-cth thermo hygrometer and j411-th thermo hygrometer. Environment Comfort Display :“COMFORT”, “WET”, “DRY”, Temp. Humidity Accuracy : +8% RH, Battery : AAA 1.5V. Time / Temp / Humidity indicate. Temp. reading for oF & oC. MAX and MIN Temperature and Humidity Memory. 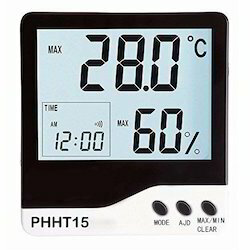 We are engaged in supplying a quality range of Thermo Hygrometer (Digital), which is used for measuring room temperature and humidity. Widely demanded in Manufacturing units, Computer rooms, Laboratory, Storage and Environmental controcan, these are engineered with precision to ensure accurate performance. 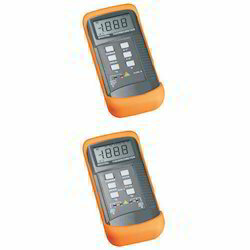 Our clients can avail these Hygrometers at competitive prices in the market. Time and Alarm Clock , 1,12 and 24 hours when the system, said switching system ,2,8 minute intervals Alarm. 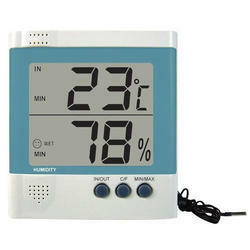 2 rows Big Digits LCD display, Indoor temperature and humidity display at the same time.Maximum and Minimum temperature and humidity function,Daily reset of maximum and minimum record functions with internal clock. 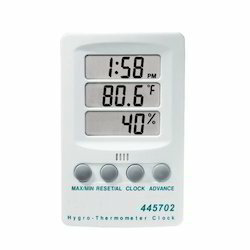 Looking for Thermo Hygrometer ?